When the tooth fairy comes whether it’s for the first or the tenth time, you always want it to feel special…these moments are fleeting and before you know it they will be in braces and then a retainer which you’ll then be reminding them to pack for college and…oh, gosh I’m getting misty thinking about it. Money is always an option and there’s lots of opinions on how to handle it: a larger amount for the first tooth (say $5), then a smaller, but consistent amount for the rest (like $1-$2); or always giving a special silver or gold coin. The ideas I’m sharing below are if you decide not to go the cash route (I’ve always preferred not to give money as a gift). Preparations: To begin, you will need proper provisions, which usually come in the form of a Tooth Pillow. What is that? They come in variety of types, but the general idea is that there is a pouch for a tooth to fit (and a pouch for a little present to replace the tooth if that’s the way you go). 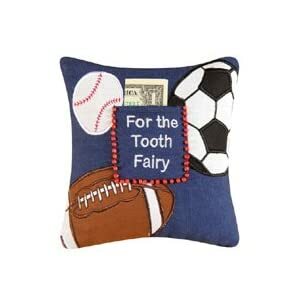 I like this American Girl Tooth Pillow ($18.68), featured image, because it hangs on the door and you don’t have to deal with the worry you will wake your dreaming toothless angel. 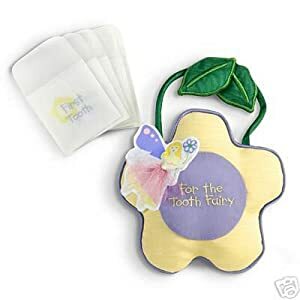 This Maison Chic Tooth Fairy Pillow Owl ($9.99) is just adorable, but does not hang… but some grosgrain ribbon, needle and thread can fix that, and for your all-star, this Tooth Fairy Sports Pillow ($14.99), image above right, covers all the bases. Fairy Wares: To set the right tone, you may want to leave Pixie Dust just “around” in which case you can either buy it bulk, like this set of 6 jars from Hearth Song ($34.98) or just get some loose glitter ($29.99 Martha Stewart) shown right. You can still fill a Fairy Wings Bottle ($7.95, Fairy Dust, Ltd.) with the shimmery stuff and make a special gift. They also have this Pocket Magic Dust ($5.50), shown left, that looks whimsical and fun. The tooth fairy can be forgetful. She may have left something behind, like this Sequined Wand ($8.61, Amazon) or this Princess Pixie Wand and Crown Set ($12.50, Amazon) pictured center. Maybe she was SUPER generous and gave your special kid her extra set of wings. Psst…She did a combination of all these things a couple times in my house. Party City has fairy wings ($14.99) that don’t break the bank, and places like CostumeSupercenter and any Halloween retailer will have major deals on costume related products until schools starts up again. 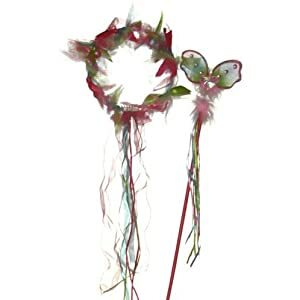 If you want to go the handmade route, Fairy Wings Boutique has beautiful, unique designs, but make sure that they are well cared for. Start a Tradition: Especially if this is a first tooth, you can use this moment to begin a tradition (that will likely morph as they get older and start to lose molars, but it will be a fun foundation). Matchbox Cars or Barbies are a nice collectible idea (my tween daughter still wants the new Christmas Barbie every year and she hasn’t “played” Barbie in over six years). If you’d like start a tradition that has longer (and older) legs, you could also get a little girl a charm bracelet for her first tooth and for every next tooth adorn it with a new charm — Pandora or Trollbeads can work in a similar way and could carry over into other special “natural” girl moments I won’t get into here. Other collectible ideas are comic books–either pick a series or a genre–Legos, which have lines for younger ones and then get more complex as they grow, or sticker books. Toothbrush Set: Firefly has a Batman and Barbie set ($8.99, drugstore.com) that is great for kids 3+ that helps kids know how long they should be brushing. There’s also these Hello Kitty and Scooby Doo ones (starting at $5, Walmart) that are more retro cool-ish. To make sure you get the right size and that specific toothbrush features (rotation/motion) are OK for your child, double check with your dentist. Get the Family Involved: Lastly, when a trip to the dentist precipitates a visit from the tooth fairy, sometimes part of the “treat” is what we call a Backwards Dinner–essentially when we have dessert first, and the person for whom we are having the Backwards Dinner gets to decide what we have for our entree/aka: dessert. The catch is, no one is still hungry after eating the sweet stuff, so it should really be called “No Dinner, Just Ice Cream Sundaes” but that wouldn’t be responsible…so we don’t. But we sure have fun. Have other ideas? Tell me about them in the comments below. Pretty great post. I simply stumbled upon your blog and wanted to mention that I’ve truly loved surfing around your weblog posts. In any case I’ll be subscribing on your rss feed and I hope you write once more soon!